The Apaches called it “squaw’s metal.” But the mountain men, drawn to the wilderness now called Arizona in a quest for exploration and discovery, called it gold. It was plentiful in the early 1800’s and one mine in particular – Lost Adams Diggin’s _ was one of the most notorious. There were other mines, including the Lost Dutchman, but this one held special appeal. Why did it take 150 years to resolve its location? And what did it take to uncover the historical information needed to locate Adams’ “zig zag” canyon? What did the authors discover that instilled in them a special kinship with those early explorers and to the natives who were only defending their lands? Here is a story that is richer than gold – one that has to be told. 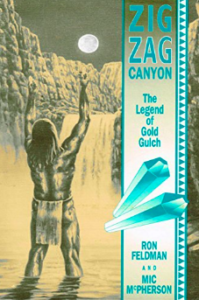 Zigzag Canyon, is a historical novel (honored by the Zane Grey Society with its Book of the Year award) and compelling story about the interactions between the Apaches of eastern Arizona, Mexican settlers, mountain men, and Anglo prospectors. This spellbinding story tells the tale of a fabulously rich placer mine, the men who discovered it, those who died there, and others who spent their lives trying to rediscover it. Fair warning, once you start reading, this book is hard to put down. Purchase paper back or kindle here.